Playing Zoo Tycoon gives non-profit organizations resources to save endangered species each month. Each month, Microsoft will issue a community challenge in Zoo Tycoon concerning an endangered species. Once the challenge has been met, Microsoft will donate $10,000 to a community-chosen non-profit organization. Voting is underway for the first organization. Release 1,000 rhinos to the wild in Zoo Tycoon and Microsoft and Association of Zoos and Aquariums (AZA) will donate $10,000 to help protect and deter further poaching of rhino horns in Africa. Adopt 1,000 Komodo Dragons in Zoo Tycoon and Microsoft and AZA will donate $10,000 to support the Komodo Survival Program's work with the Indonesian government to protect this species. 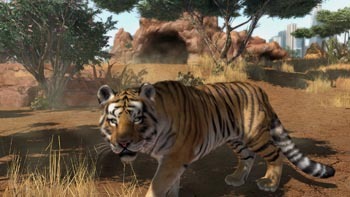 Release 1,000 Sumatran Tigers into the wild in Zoo Tycoon and Microsoft and AZA will donate $10,000 to the Tiger Species Survival Program to help reduce the number of Sumatran Tigers killed, displaced, or caught in snares. Voting for the first charity and challenge closes on Dec. 31. Zoo Tycoon launched on Nov. 22 for Xbox One and Xbox 360. In the single player business simulation game, players can care for their zoo animals, including lions, tigers, bears, elephants, rhinoceroses, hippopotamuses, giraffes, antelopes, chimpanzees, lemurs, capuchins, binturongs, red pandas, sloths, mongooses, fossa, meerkats, iguanas, snakes, monitor lizards, tortoises, flamingos, peafowl, and macaws.